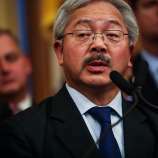 I can’t say I knew Mayor Ed Lee well; I have probably talked to him less than a dozen times. But he always knew who I was and greeted me with his characteristic smile. He always asked what was happening in Richmond. We last chatted just a week ago at the pre-dinner reception in the Impressionist Gallery of the Chicago Art Institute as part of the North American Climate Summit in Chicago. The next day, he was on a panel discussing Ambitious City-wide Action Plans. Ed Lee was sort of an accidental mayor, not seeking the office but being reluctantly drafted into it by civic leaders. Once installed, he took to the job las if he had trained for it all his life. Having not been in competitive politics prior to his appointment, he had few enemies – an envious position from which to start a new career. With the wind at his back in a city still emerging from the Great Recession, he concentrated on building San Francisco into an economic powerhouse, attracting technology companies and their employees and essentially eradicating unemployment. The city’s economic success, however, highlighted homelessness and dislocation and encouraged critics who longed for the good old days when the economy was lackluster and competition for housing was weaker. He began to prioritize these issues his second term. 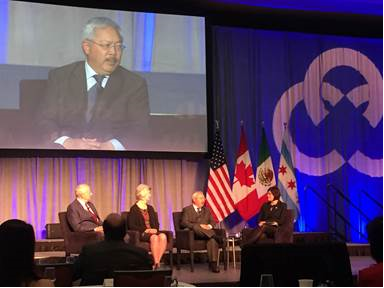 I admired Mayor Lee for his technical and problem-solving skills, his easygoing ways, his optimism and his cheerfulness. Most of the times I had an opportunity to talk to him were at functions relating to fighting climate change, sustainability and resilience, all of which he championed. Mayor Ed Lee, the city’s first Asian American mayor and the man who presided over San Francisco’s rise to the top of the tech world, died early Tuesday morning after suffering a heart attack. He was 65. Lee collapsed while shopping at the Safeway grocery store on Monterey Boulevard near his Glen Park home at about 10:30 p.m. Monday and was taken by ambulance to San Francisco General Hospital. He died at 1:11 a.m., surrounded by his friends and family. The mayor’s office released a brief statement early Tuesday morning confirming Lee’s death, stating in part: “Our thoughts and prayers are with his wife Anita, his two daughters, Brianna and Tania, and his family.” Flags at City Hall are flying at half staff. News of Lee’s unexpected death shocked and saddened city officials, many of whom respected the moderate mayor even when he was their political adversary. Supervisor Aaron Peskin was crying as well remembering Lee. “Even though he didn’t support me when I ran for supervisor a couple years ago, he was somebody who was a brother who I admired, not only as the first Chinese American mayor in San Francisco but as somebody who loved the community and was fun to hang out with,” Peskin said. 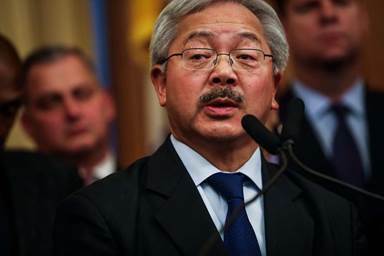 Lee, known for his friendly and often jokey personality and his focus on details and political consensus, was the 43rd mayor of San Francisco and the first Asian American to lead the city. 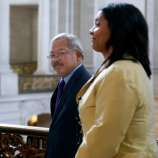 Board of Supervisors President London Breed became mayor, effectively immediately. San Francisco Mayor Ed Lee — the city’s first Asian American mayor — died early Tuesday morning after suffering a heart attack. He was 65. Lee was city administrator in January 2011 when the Board of Supervisors appointed him to replace Mayor Gavin Newsom, who had been elected the state’s lieutenant governor. 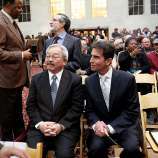 Lee initially said he wasn’t interested in being mayor, but relented and took the job after a public campaign led by Chinese American civic leaders — the slogan was “Run, Ed, Run!” He said he wasn’t interested in a full term, but after solid job reviews and months of urging from former Mayor Willie Brown, now a Chronicle columnist, the late Chinatown power broker Rose Pak and, ultimately, Sen. Dianne Feinstein, Lee changed his mind. Lee won election to a full term in November 2011 and was re-elected in 2015. An early accomplishments was 2011’s “Twitter tax,” which cut payroll taxes for six years on a sketchy stretch of Market Street and lured thousands of tech jobs and workers to the city. While Mid-Market has since been partially redeveloped with new offices and hotels, the overarching effect of the tax cut was to draw startups and established tech companies to the city, which now has one of the lower unemployment rates in the country. The move, though, drew backlash from city housing advocates. Many blame the city’s exploding rents, housing shortage and persistent homeless crisis on the tech boom. Lee recently focused his office’s efforts on the homelessness problem, opening Homeless Navigation Centers — shelters that allow people to move in their partners, pets and belongings and which offer expanded service — and last year creating a new city Department of Homelessness and Supportive Housing. The department’s first director, Jeff Kositsky, said: “I’m shocked and saddened and heartbroken. The Board of Supervisors now will appoint a new mayor if its remaining 10 members can get to six votes — Breed is no longer a supervisor. If no candidate gets that majority support, Breed would continue to serve as mayor until a special election is held in June 2018. The next regularly scheduled mayoral election is in 2019. “I just feel so deeply sad,” Supervisor Hillary Ronen said. “There were often times I disagreed with Ed Lee politically, but he served the city for 40 years. I’m glad I had a chance to work with him for the past year on homelessness. “One of the biggest surprises since I became supervisor was how well I worked with Ed Lee tackling homelessness in my district. I had the pleasure of watching him work in the Navigation Centers and I saw how deeply he cared,” she said. Gov. Jerry Brown called Lee a “true champion for working people,” who “epitomized the California spirit. He’ll truly be missed,” Brown said. Members of Congress with strong ties to San Francisco also expressed their condolences after learning of Lee’s death. Lee was born in Seattle, the fourth of six children of immigrant parents, and grew up in housing projects. His father was a cook, his mother a seamstress. He won a scholarship to Bowdoin College in Maine and then went to UC Berkeley Law School. He met his wife, Anita, in 1974 when he was studying in her native Hong Kong, where she was his Mandarin tutor. Before he worked for the city, Lee fought it. As a law student and intern at the Asian Law Caucus in 1978, he represented residents of the Ping Yuen public housing complex, who were angry over unsafe and unsanitary conditions, in the first tenant rent strike against the San Francisco Housing Authority. Lee threatened to “use whatever avenues we have to make the Housing Authority responsible to the tenants.” The Housing Authority finally agreed to provide security. He went on to a distinguished career as a civil rights attorney, often representing low-income tenants. In 1989, Lee represented Asian and female firefighters who joined others in successfully suing the city for discrimination at the Fire Department. Hayes-White, the city’s first female fire chief, said her professional relationship with the mayor dates back to the early 1990s, and he would often remind her about about his efforts to diversify the department. In 1991, under then-Mayor Art Agnos, Lee became director of the city’s Human Rights Commission, where he spearheaded policies to increase the hiring of minority-owned businesses as city contractors. When Brown became mayor, Lee asked for the job of city purchasing director. Lee spent two decades working for the city, eventually becoming director of public works and city administrator, overseeing multiple departments. His rise to the top political position in the city was a testament to the power wielded by Chinatown and the city’s Asian American community. Many Chinese American residents saw Lee as one of their own during his initial run for office. Lee’s political capital in Chinatown, though, began to diminish as housing woes increased. Before her death last year, Pak openly criticized the mayor she once worked to get into office. But even as they criticized him, many Chinatown community leaders still supported the mayor, turning out for public events and maintaining personal friendships with him.